All the useful information that you need to know before sending money with ICICI Bank Money Transfer! Incorporated in 2000, ICICI Money2India is powered by ICICI Bank Ltd, one of the oldest online remittances service for NRI’s for transferring money to India from around 9 countries. With Money2India you can send money from Australia, Canada, Hong Kong, Singapore, Sweden, Switzerland, UAE, UK and USA to a beneficiary in India (In any bank account). Transfer money in just 3 clicks. Transfer money using mobile apps. Transfer money via voice command to Siri. Using inter banking platform, ICICI NRI account holders can do international money transfers. Pay bills to nearly 100 services directly via Money2India like telephone bills, Insurance premiums, prepaid mobile recharge and so on. Fixed exchange rate - With this one can lock the exchange rate and transfer fix amount in rupees. Biometric login for mobile app. Money2India is rated 9 out of 10 for NRI’s who wish to transfer money from Australia, Canada, Hong Kong, Singapore, Sweden, Switzerland, UAE, UK and USA. Money2India is part of India’s largest private sector bank which makes service mush faster. NRI’s who are doing banking with ICICI bank will get direct benefit of M2I service. Money can be transfer online and offline via both the modes. Pricing : How much does ICICI Bank Money Transfer cost? On Pricing or service charge we rate ICICI Money2India 7 out of 10 as we still feel that in some corridors fees are higher than average on small amount transfer.Please find below the charges on different amount by countries. Free Money Transfer on and above INR 65,000. Free Money Transfer on and above USD 1000. Transparency: Does ICICI Bank Money Transfer have any hidden fees? Money Transfer process with ICICI Money2India is complete transparent, you will get update from Money2India on every stage from initiating the request till receiving money in recipients India account - we rate ICICI Money2India 9 out of 10 for Transparency. Transfer Speed: How long does it take to send money through ICICI Bank Money Transfer? On website Performance and Money transfer Speed - we rate ICICI Money2India 9 out of 10 for Speed. Maximum case ICICI Money2India service do same day fund transfer when both the transfer modes are Bank to Bank. Pay in Option with ICICI Money2 India are Direct from Foreign Bank Account or CashCard, where Pay Out Option with ICICI Money2India are Any Bank Account in India or CashCard or demand draft which will be dispatched to your recipient in India. Other then online money transfer, ICICI Bank also provide Offline Money transfer service for Correspondent Banks and Foreign Currency Cheques. In Correspondent Banks, ICICI Bank has partnership with several banks and exchange houses to transfer money in India included Insta Transfer, Speed Transfer, and Demand Drafts. In Foreign Currency Cheque, ICICI Bank accept foreign currency cheques, travellers cheques, demand drafts, cashier orders, pay orders, and bankers cheques where money will be credited into your account form 1 business day to 21 business days. Security : Is ICICI Bank Money Transfer Safe? Money2India is 100% secure money transfer service with Firewall and 128 bit encryption Money2India safeguard your personal, financial and transactional details with international standard. Money Transfer process is completely secured and we rate ICICI Money2India 9 out of 10 for Security. For providing best user experience Money2India is adding loads for features to its technology suite as as Mobile app, quick money transfer service in 3 steps, Siri integration and so on. 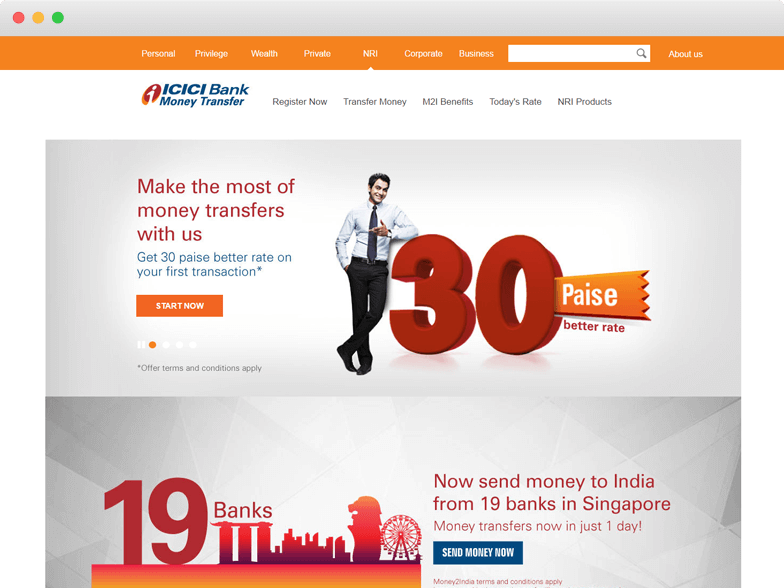 We rate ICICI Money2India 9 out of 10 for User Experience. Coverage: How many Countries & Currencies does ICICI Bank Money Transfer support? Money Transfer service with ICICI Money2India is limited to 9 countries, while there is growing demand in global market for this service Money2India need to consider extending services to more countries - we rate ICICI Money2India 7 out of 10 for Market Coverage. I had to jump through hoops to get correct id verification to open this account and for them to set up a direct debit and now I've been trying for 2 weeks to access my account online. Customer Service is a joke. Either they don't listen to what is being said or they are just reading off a script. Every question is ignored and the same spiel is reeled out. I received my URN no but their system didn't recognise my details which I confirmed were correct with the operator. I was then locked out of trying to access a password for too many attempts and have to wait 24 hours before I can try again and I have to get another URN number into the bargain. I am seriously considering closing the account as their system is a joke. If they want to operate in the UK they have to seriously up their game and get some staff who understand what you are saying, know the system and can offer some real help. Worst customer service - especially over the phone. I just cannot understand the logic of why they cannot update their portal with the right customer care number. There are so many numbers provided except the right one. You call any of the numbers provided, you get a voice message which states us to call a 1860 number!!! why cant they just update the portal. AND MOST IMPORTANTLY... why cant you have the number actually work. Its almost impossible to get connected to the number. Worst service... :( I am about to cancel my account and get rid of the frustration all together. Never, never bank with icici. I used to bank with them when they first appeared with no issues, now six months ago I decided to bank with them again. Here I am now, still trying to access my account. They missed of 2 digits from my mobile number so it’s impossible to get messages, verification is also impossible as they can’t ring you back. I can’t wait to close my account, never never will I bank with icici again, worst customer service ever, they read from a script and will never deviate from it, not even to help, as for email support, non excistant. Thought it’s states on all email returns it’s there to help! Avoid this bank. Worst customer experience in the world. Response times poor, email responses are merely copy and pasted material from website with no one even bothering to answer your question correctly. I was overcharged TDS and and they have requested share certificates from me that they hold themselves! There is no way they can call themselves a bank, they are more of a circus. Avoid this organisation. Bad customer service. Their online chat is a joke. The customer service specialist did not make correct address change. Went to branch, gave my id to fix it, still wrong. Created another online service request. They make it really hard and the website does not work most of the time. Unable to remove auto renewal in FD. Went to branch and told the manager in besant nagar still auto renewal isn't removed. They are super lazy and incompetent. Bad staff. Also, one of the employee gave me his whatsapp number and said contact me (as in trying to make a pass at female customer). Worst bank, unprofessional staff. Shockingly bad - AVOID! Pity there is no option for zero stars, as ICICI Bank doesn't even deserve one!. Registration process was painful and lengthy, relying on infrequent emails. Finally got near the end and managed to log into my account. However, I couldn't transfer any funds (thank God) as my nominated account was missing. After reviewing past emails I had two confirming this account had been setup succcessfully and debit debit was in place. I sent an email asking why this was, to then recieve another email saying my account had been cancelled completely!!!!. Wow. How it's possible for a banking organisation like this to be established is beyond me. Beyond bad. Stay clear. Really slow setup, poor service, and could never actually access my account! Opened their bonus saver account after seeing it recommended on Money Saving Expert. It took a month to setup the account. You receive confusing emails saying you need to confirm your DD details but there's no action actually required. When I finally received my login details, I couldn't login using the Customer ID they provided. Thinking I may have input the wrong password I tried to reset it, but was told my ID didn't exist. The same ID confirmed in multiple emails from them. Tried to call their support team but an automated message said they were too busy and it hung up. Sent an email that was responded to 2 days later saying I had to use a certain browser and clear my cache or that it may have been a technical error at the time. I attempted their steps and still no joy. I sent them screenshots as requested, to receive another email 2 days later saying they'd need to take some time to look into it. When they did come back the next day they wanted another 10 days to look into it. I immediately asked to close my account. I wish I'd read the reviews on here first. Their emails and online portal look very amateurish. Glad I did never get to trust them with my money! Customer ID:	552031651 To, ICICI Bank Limited CIN No. L65190GJ1994PLC021012 Registered Office: ICICI Bank Tower, Near Chakli Circle, Old Padra Road, Vadodara 390007, Gujarat, India. Tel :+91-265-6722286 Corporate Office: ICICI Bank Towers, Bandra-Kurla Complex, Mumbai 400 051. Tel : +91-22-33667777 Fax : +91-22-26531122 SENDING CONSOLIDATION MAIL IN RESPONSE TO CUSTOMER GRIEVANCE WILL NOT HELP IN DISAPPEARING ALL THE ISSUES WITH ICICI BANK LIMITED ITS BEEN THREE MONTHS NOW STILL MY ISSUES IS NOT RESOLVED BY YOUR BANK. WHAT ARE YOU WAITING FOR ? Will ICICI Bank Limited reverse all the Minimum Balance Charges levied when customers sends some consolidation mail to your bank. NO NEVER. IT WILL NEVER HAPPEN IN THE HISTORY OF ICICI BANK. SO HOW DOES ICICI BANK ASSUMES THAT SENDING APOLOGY MAIL TO CUSTOMERS IN RESPONSE TO HUGE NEGLIGENCIES BY THE BANK WILL HELP IN SORTING OUT THE ISSUES FACED BY THE CUSTOMERS. NO CONSOLIDATION MAIL EVER HELPS IN SORTING OUT ANY ISSUES IN THE WORLD. PROVIDE ALL THE CCTV FOOTAGE STARTING FROM MY ACCOUNT OPENING TO ALL THE DOCUMENTATION DONE AT YOUR BANK FOR MY ACCOUNT OPENING. YOUR BANK IS DESTROYING EVIDENCES AND DOCUMENTS TO HIDE THE APPARENT NEGLIGENCE COMMITTED AT THE TIME OF OPENING MY ACCOUNT. ICICI BANK LIMITED HAVE TO PROVE INNOCENCE IN MY CASE BY PRODUCING SUFFICIENT AND SATISFACTORY PROOFS IN SUPPORTS OF YOUR CLAIMS MADE. The below are the issues against your bank as per mail dated 09th February 2018 Now let me highlight you about my experience on visiting my home branch of ICICI bank for updating my Aadhar Details 22nd January 2018:- 1. I reached there with my Online Aadhar Copy and asked the officials to update the same in my account. They said they will not be able to check/verify my Aadhar Details online as the system is not working. On asking when the system will get working I did not get any assured date. Why ICICI bank did not had their system running and moreover why there are No Back Up System which can work when one system fails ? Why even might be your system comes to Normal I had not been informed about the same? Why they did not kept my documents with them as they might will be able to update the same once the system backs to normal/working ? So, Shall I conclude that ICICI Bank has failed to provide basic banking facilities which are supposed to provide as a Private Banking Organisation. They told me to come with my Original Aadhar Card upon which they will not have to check /verify anything and will update necessary changes in my account. I got shocked to hear that as per the bank officials if we provide any Original Document bank do not need to check or verify the authenticity of the same. As they straight away carry out all the banking activities upon receiving the originals documents. I thing the bank officials did not get proper training to carry out Banking Activities. BANK AND ANY ORGANISATION in the world is liable to check and verify the authenticity of any document regardless of whether it is a xerox copy or Original ones. Simply having original documents does not guarantees that they authentic too. In market many fakes and illegal documents are available which looks like Originals. Does ICICI bank will carry out all activities simply someone possessing having an Original Looking documents with them. THIS WILL BE A DISASTER FOR BANKING. BANK NEEDS TO VERIFY/AUTHENTICATE ANY DOCUMENT WHETHER IT IS A XEROX COPY OR ORIGINAL ONES. SIMPLY POSSESSING ORIGINAL LOOKING DOCUMENTS DOES MAKES SOMEONE AUTHENTIC AND SIMPLY POSSESSING XEROX COPIES OF DOCUMENTS DOES NOT MAKES SOMEONE UNAUTHENTIC/INVALID 2. I had asked to update/change my mobile number which they refused to do as I did not had my Original PAN card with me and so provided them with a Xerox Copy of the same. Having a xerox copy of something does not makes it Illegal/Unauthentic/invalid. They simply refused to change the same without any original documents which I did not had unfortunately with me. One more thing here to be noted is that my secondary mobile number had been updated in my ICICI Bank Account which I am surprised to see. I want my Account Opening Form to be checked for finding the error who had committed. ICICI Bank has once again failed to carry out basic banking activities and I can conclude that ICICI bank has been found NEGLIGENT IN RENDERING SERVICES. 3. My legal name has also been not updated as per the documents which I had provided at the time of Opening the savings bank account which is a big shame for ICICI Bank. I think proper training and guidelines have not been provide to the banking officials and also there is no proper cross-verification of data at ICICI bank. Because of the incorrect updation of my name I did not able to link my Aadhar Online. I want my Account Opening Form to be checked for finding the error who had committed. ICICIC Bank has once again failed to carry out basic banking activities and I can conclude that ICICI bank has been found NEGLIGENT IN RENDERING SERVICES. 4. The list of error committed by ICICI Bank does not stop here as ICICI bank has also updated incorrect address in my savings bank account. In banking there should not be even mistake of ONE Letter/Alphabet, ICICI Bank has shifted entire word from my residential address here and there. Let me ask you that kind of people do ICICI Bank employs and what kind of checking/verification/audit do generally ICICI bank performs ? ICICI Bank has once again failed to carry out basic banking activities and I can conclude that ICICI bank has been found NEGLIGENT IN RENDERING SERVICES. When we customer fails to perform/keep our agreed minimum balance in our savings account ICICI bank charges Minimum Balance Charge. The Bank wants to be compensated for failure of the customer to perform/keep the agreed amount. As now ICICI bank has been found NEGLIGENT IN RENDERING SERVICES what compensation amount should I claim from ICICI Bank for the problems faced by me, Time Wasted, Mental Harassment gone through due to the negligent of the ICICI Bank ? I am feeling bad that I’m late to check this site . This is the worst service ever. They promised a rate of 94 and finally amount credited was 93, and that too after chasing these guys continuously. I would suggest people not to use their service ever. I have learned the lesson in a hard way. These banks are earning money by playing with others money. To just change address on the account, there is no page on the portal. You need to raise a service request with utility bill. And then they send you a new card to previous address and disable your existing card before the activation of new one. You try to contact them via email, call and chat, nobody knows how to sort the problem. Takes 2 days to reply everytime you email them. Calls wont reach because apparently there lines are busy(of course with this bad service). Stay away. Beware fraudsters operating in the Indian branches in India! One clerk pestered and sold a fixed policy from my wife's account under the pretext of an interest-saving bond. They are ready to take advantage of the gullible anytime. When you complain the hierarchy doesn't want to know, they are all in it together. This fraudster got transferred and his whereabouts are not known. Not only that this bank communicates through emails and WhatsApp?? Terrible, they can't investigate a complaint or even write a letter with postage on it. You don't who's who on WhatsApp. Never again will I open an account in a freebie cheapskate Indian bank. I will choose a foreign bank operating in India instead of an Indian bank with pig-headed staff who only wants £s and $s deposits and say no to rupee deposits. Ridiculously slow account set up system! Friday - made on line application for account. Received email same day advising application being processed. Would receive update in 2 working days. Good! Sunday (2 days later) - received email confirming they had okayed my identity and were setting up direct debit (D/D) with my nominated linked account, so as to be able to transfer monies to/from. Good! However, advised 5 working days needed to set up D/D! Why D/D to move monies around? Unusual system! Slow! Following Wednesday - checked my linked account and noted direct debit had been set up. Good! Following Tuesday - 7 working days after ICICI last email (5 working days after D/D had actually been set up), received email confirming account & D/D set up. So slow! BUT now advised another 2-3 working days for them to debit initial £1 transfer (maximum allowed when applying for account! ), after which I would receive account number and internet banking details, in order to transfer total monies I had wanted to transfer to account in first place! 9-10 working days since account applied for! Ridiculous system! Next day (Wednesday) - received email confirming unable to proceed with initial transfer as D/D cancelled. Why? Because I had cancelled it! Fed up with waiting! Had applied on line on previous weekend (note - not a working day!) for account with alternative bank - with minimally lower interest rate - but accepted same day and able to transfer monies and earn interest immediately! Wasted a whole hour trying to open a savings account online after checking out moneysavingexpert top savings banks. Don’t bother. Where do I begin? For a start a bank that’s targeting UK customers sets their default place of residence in their drop down menu beginning with Afghanistan-not impressed having to scroll down to U. Added to that the countries were not all in alphabetical order - I happened to spot Malaysia amongst the N’s ! Then their telephone format requires you to drop the first zero to accommodate the country code dialling but it omits to enter the +44 prefix so you could easily key in your phone number without realising that the last digit has not been entered. But the final straw was In trying to input my address with post code and door number. This usually presents you with a drop down menu of addresses from which you select yours. No such luck here - there’s no “Get address” button so I proceeded to enter my address manually and having done so I clicked “continue” only to be told on the next page that my address is incomplete, but not saying where. This goes on for several times until I give up and call customer support who was frankly clueless. I then went onto another computer using windows explorer thinking that it might have been the browser but sadly no such luck (or perhaps I was lucky enough not to have been able to open the account) So just don’t bother unless you’re prepared to waste more than an hour of your life getting nowhere. I gave up an opened an account with Cynergy in 5 minutes. Tried to open an account three weeks ago as highest interest rate offered on MoneySupermarket. Promised to get back to me within 2 days but didn't. Customer Services didn't recognise my application number, but when I emailed them they said it was being processed. Still nothing. Having read the other reviews here i think I'll give it a miss. Be very careful about this bank! They are being incidentally promoted on Money Savings Expert as they have the current top rate on a savings account. I approached them by email to ask a very simple question - finding that the answer I needed was not in any of their online info. The reply came that I should look on their website - ie: the person replying could not be bothered to answer my very simple question. So I then spent another 30 minutes searching fruitlessly on their website for the answer - and failed to find it. The impression created is very poor - of a 'bank' that is unable to deal with the easiest query either efficiently or politely. No matter how good the interest rate, I would be extremely wary of becoming a customer here. The other reviews I have just seen have confirmed my impression. On Customer Support, Money2India has 24X7 helpline with Toll Free Numbers for USA, Canada, UK, Australia, Singapore and UAE. Toll free numbers are available for NRIs when in India and Non Toll Free numbers for NRI’s in Hong Kong, Sweden and Switzerland. Money2India also have email support, online chat, request a call back and social media presence on Facebook. With all the above service you will get top notch customer service with Money2India to resolve any query ASAP.